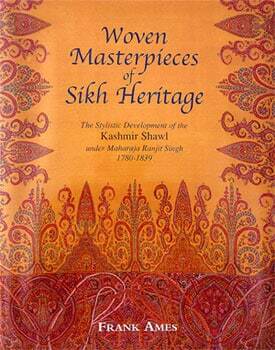 Frank Ames Book Signing – On June 1st at 5:30, Nazmiyal Collection will host a book signing for Frank Ames as he promotes his newly published work: Woven Masterpieces of Sikh Heritage – The Stylistic Development of the Kashmiri Shawl under Maharaja Ranjit Singh, 1780-1839. The new 254 page book contains hundreds of beautiful color images and an incredible amount of information. Mr. Ames has spared no expense at compiling the best images and information available and does so with a finesse and eloquence not typically seen in such informative works. Expanding into new territory, Woven Masters of Sikh Heritage focuses on the Khalsa movement. During this era of Punjab India’s history, a variety of complex and enigmatic patterns developed in the shawl, some geometric, others symbolic. Ames describes with amazing detail, the nature and source of the patterns that define the Sikh period. Frank Ames, an art dealer for the past 35 years specializing in rare exotic textiles and oriental rugs, brings exceptional insights and information to the world of historical artistry. This will be a unique opportunity to meet the author and network with others interested in antique oriental rugs, textiles and weaving.